Although it poured, Evan arrived, brightening up a cloudy day. 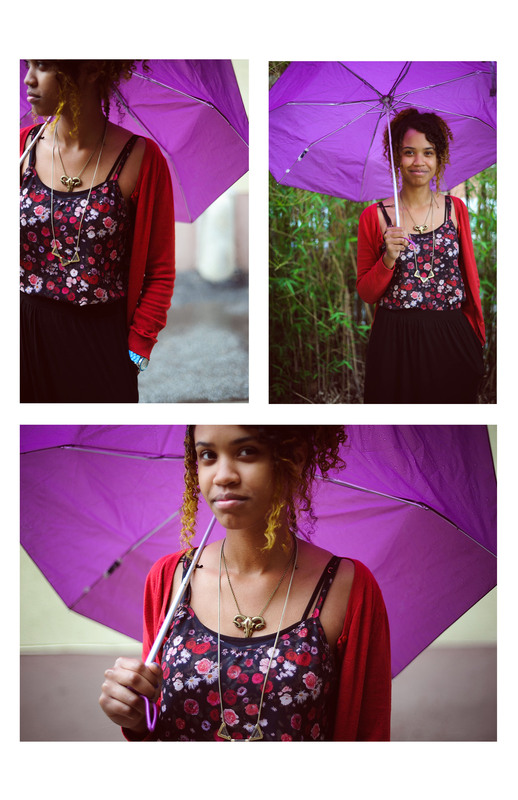 Evan Odoms: I would describe my style as quirky/moody/quasi hipster, because I can’t fully commit to one style. It often changes depending on what mood I’m in that day. I also love prints. JN: What are you favorite shops in the city and online? EO: I’m always online getting ideas from Lookbook.nu and I frequently shop at Forever 21 and H&M. I’ve recently gotten back into shopping at Ross, Marshall’s, and TJ Maxx. A lot of my jewelry is from accessories stores like Francesca’s, Lou Lou’s, Luna, or random boutiques I stumble into. One of my favorite necklaces is a Ritz Cracker I got from a boutique in Philly. JN: What brands are you wearing right here? EO: I’m wearing a skirt, cardigan, and top from H&M. My shoes are from DSW, my watch is from Kohl’s. The ram skull is from Luna, and the longer necklace is from a boutique in Brooklyn that was going out of business. Gina Knee, A Walk in the Rain, undated, Watercolor with charcoal on paper; 20 1/2 x 25 5/8 in. ; 52.07 x 65.0875 cm. Acquired 1942. The Phillips Collection, Washington, D.C. The walls of Tryst at the Phillips café have been transformed by artist Sandra Cinto. Watch as she installs, touches up, and discusses her work for Intersections, One Day, After the Rain.